The spotlight is squarely on a number of high profile managerial appointments when the qualifiers for the 2019 Africa Cup of Nations resume this weekend. Defending champions and hosts Cameroon have parted company with title winning coach Hugo Broos. 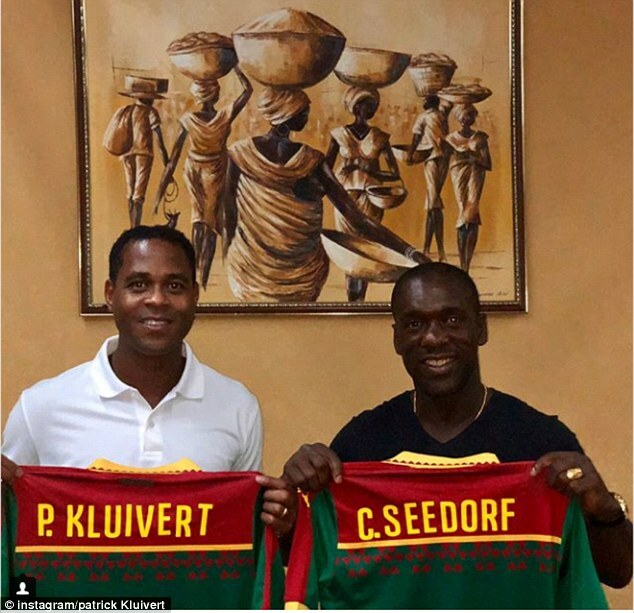 New coach Clarence Seedorf, assisted by Patrick Kluivert are the new faces in charge of the five-time champions. Eighteen months ago in Gabon, Belgian coach Broos guided a team of virtual unknowns to surprise success over an experienced Pharaohs side. Broos’ replacements – Seedorf and Kluivert – are as high profile as they come. Former Dutch international Seedorf was a celebrated footballer, notably winning four Champions League titles with Ajax Amsterdam< Real Madrid and AC Milan. But his coaching career is yet to take off. His last station was a six month sojourn with Spanish club Deportivo La Coruna, which ended in relegation to Segunda. His deputy, Kluivert, assisted Louis van Gaal as Holland finished third at the Brazil 2014 World Cup, but he has never been in full control of a club or country. Seedorf’s first task will be to claim victory over lowly Comoros, who have never qualified for a Nations Cup finals. However, for the Dutchman to cement a lasting legacy, he must become the first Indomitable Lions tactician to retain the continental title since Cameroon won back to back editions in 2000 and 2002 under Pierre Lechantre (00) and Winfried Schäfer (02). For that to happen, he will need the services of self exiled stars like Joel Matip and Eric Maxim Chuopo Moting. Elsewhere, new Egypt boss Javier Aguirre Onaindia, who replaced Hector Cuper, is tasked to help the Pharaohs rediscover the dominance that saw them win three consecutive titles between 2006 and 2010. Not even a dispute between the team’s leading star, Mohammed Salah and the country’s FA over image rights can stand in Aguirre’s way when Egypt welcome Niger for a Group J face off. Meanwhile, former African Footballer of the Year, Emmanuel Amunike, who starred for Nigeria’s Super Eagles as they lifted the 1994 edition, has been tasked to inspire the Taifa Stars of Tanzania to new heights. Tanzania are geographically and population wise one of Africa’s largest countries but they don’t punch their full sporting weight. Amunike’s maiden competitive encounter sees him take the Taifa Stars to Kampala to face Sebastian Desabre’s Uganda Cranes in a Group L match up. Other interesting tacticians to look out for include Senegal’s World Cup boss Aliou Cisse who takes the Lions of Terranga to Madagascar. Cisse will have to don’t his football thinking cap. In Madagascar, they face a well motivated side that won their opening Group A game away to 1970 champions Sudan. Africa’s other World Cup representatives, Morocco and Nigeria, have also chosen continuity. Altas Lions boss Herve Renard will be expected to negotiate a straight forward Group B home tie against paper weights Malawi whereas Nigeria’s Gernot Rohr also has a winnable Group E away tie to islanders Seychelles.